Welcome to September, to fall, to changing leaves, and the start of the busy end-of-year wrap. If you are like us, you are likely focused on what can be done to end 2018 with a bang. Well, here’s some inspiration in this month’s digital rundown. 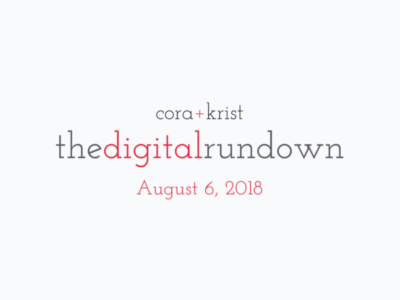 I sincerely hope that this new email series is providing a valuable glimpse into what is peaking our interest in the world of digital when it comes to marketing tactics, how to build your website and technologies that help you run your day-to-day operations. As you are well aware, we’re passionate about the power of digital. It is my hope that these highlights, from around the world, will inspire you to leap forward with new technologies, tactics, and techniques to drive your business goals in a more advanced digital way. Many businesses see the world as an open opportunity. But translating your web presence into hundred’s of languages and dialects is tricky. Amazon Web Services is looking to change that with a translation service that can really open up new markets for your site. Their new Amazon Polly Plugin seeks to provide real-time translation service. SSL certificates are absolutely necessary for any website. After all, you don’t want to lose rankings now that Google’s algorithm penalizes non-secure sites. But not all SSL certificates are created equal. Make sure you have the right one via this advice from Manage WP. We love data, and we love research-backed recommendations to improve web design. Here are 10 highly effective tips from Torque. Emails are getting smarter, are you? There is absolutely no question that email remains at the top of most effective marketing tactics. But AI is helping to make email smarter, more predictive, and thus – more effective. I know, I know – we’re beating the drum on this topic yet again. But mobile is so incredibly important when it comes to email strategy. What should you be doing to optimize your messages for this on-the-go platform? Comments, Facebook Success, and – you guessed it – Facebook is finding another way to judge you. Facebook is still king of social media and the number of eyeballs it’s capturing is by leaps and bounds ahead of all others. Kinsta took a look at 6 ways you can leverage Facebook for marketing success. Pretty basic stuff, but are you doing any of it? Have you noticed a trend with comments? They are disappearing from blogs and news sites. The conversations, if even valuable, are now shifting to social media. Kevin Muldoon took a look at why it’s time to say goodbye to blog comments. In its quest to weed out fake news and harmful content, Facebook is beginning to rank the trustworthiness of users on its platform and translating that into how content is served up in the newsfeed. So, if it wasn’t obvious before, be trustworthy and reputable – avoid selling that snake oil. No one’s buying it anyway. Markups, Voice Search, And The Downfalls of Syndicated Content. It’s about SEO. Google, in its long-running goal of creating more meaningful search experiences, is asking users to add yet another structured data markup to their articles – Date Posted, Date Modified. Search Engine Roundtable took a deeper dive. It may seem quite odd to be shouting out shopping needs in your living room to Siri, Alexa, and Google but studies show that it’s catching on and it’s important to make sure you are ready. Wondering what the potential looks like? Hubspot looked at some pretty interesting insights. If you are like many website owners, you are struggling to develop content at a rate that keeps people coming back and feeds the needs of the search engines. Some are looking to syndicated content to fill this void. Although there are some instances where it’s useful (such as feeding content for email campaigns and social media). When it comes to SEO, it could actually hurt you. WPblab has a video that talks more about this. Who has dug the deepest hole ever? In our ongoing desire to reach the mantel, many have tried – one has gotten the furthest at 40,230 feet. Give you a hint, they aren’t necessarily friends of the U.S. at the moment. In Michigan you can now get an “Amish-Uber” featuring a horse and buggy ride. Because, why not.